Panasonic HVAC has been in the cooling industry since 1958. Over all those years the company evolved from offering simple room coolers to more advanced heat pumps, VFR units and mini split ductless HVAC products designed to maximize efficiency levels. The company is known for offering advanced control systems and modern heat pumps for both business and residential users. 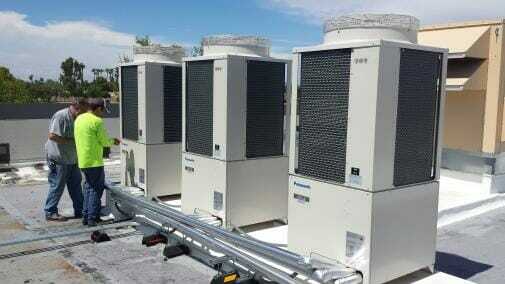 Panasonic HVAC offers commercial and residential products to its customers. There are single room and multi-room heating and cooling solutions available. Panasonic HVAC sells several mini split system air conditioner units to customers. These units consist of an outdoor and indoor unit and are either an air conditioner or a heat pump that can add or remove heat from a room to heat or cool the space. Some of the units are ceiling or wall mountable, others sit on the floor and some are built with several duct ports for warming or cooling a room from several different points. There are recessed air conditioners that stay out of the way as they are installed in the ceiling and look like standard ventilation grates. When single zone heating or cooling simply isn’t enough for a space that requires climate control, Panasonic has multi split AC systems as well. These systems come with multiple ports to send heat in several directions at the same time. When all of the ports are connected, the system pushes out heat or cool air throughout your home. These units are a bit more difficult to set up than the single split units are, but they are worth the added work because they handle climate control for several different rooms or for larger rooms. Panasonic is also one of the few suppliers of variable refrigerant flow or VRF units on the market today. These heating and cooling solutions utilize a flow of refrigerant to move heat from one place to another. What makes them so unique is that they can heat and cool different rooms at the same time. They can also provide highly variable levels of heating or cooling depending on what is needed. That means only a small portion of the systems total output can be utilized in moments when full power isn’t necessary. This makes the whole unit more energy efficient and helps to make heating or cooling a business or home more affordable in general. Panasonic carries a line of controllers for its heat pumps and split units. With the controllers it’s possible to manipulate multiple units at the same time. The advanced controller units have timer controls, fan speed adjustments and temperature settings for the different units. They make controlling many units much easier to do, especially when changing settings frequently. Panasonic utilizes highly advanced inverters in its heat pumps and air conditioners. These inverters make it possible to control compressors with a high level of accuracy. By increasing compressor control, the heat pumps and air conditioners can operate in a wider range of cooling and heating capacities and save some energy. The improved inverter also serves to quiet equipment more by cutting down on the operating speed and power necessary to achieve cooling and heating goals. By achieving a higher level of control over the compressors of a system, Panasonic’s equipment becomes more accurate and reliable and allows users to enjoy a more focused temperature range. Though Panasonic offers detailed service and reference manuals for all its heating and cooling equipment, the company does not have recommended technicians or a certification program like some other companies do. It is up to you to find a qualified technician to do the job properly. A good technician will install the equipment properly so that it performs to the best of its abilities. They will also help maintain all the parts of the equipment so that you get the full lifespan out of it. Finding a top technician isn’t an easy task. You should get quotes from at least three different contractors that all have good ratings, quality reviews and proven experience working on Panasonic equipment. Panasonic doesn’t offer gas furnaces, they don’t have any electric base heaters, but what the company does have is highly efficient heat pumps and air conditioners. The units are built for reliable performance and come designed to offer highly specific control to users.